Help customers get comfortable with your staff when they're dressed in a professional and stylish BIO Prints Ladies' Contrast Curved Placket Top! The shirt features two curved patch pockets, for toting pens, notepads and other small objects, and a curved hem with side vents. The length measures 26". This is a great way to outfit your medical team with a pleasant look that can help put patients at ease! Our comfortable scrub pant has a smooth, professional look. 4.2 oz, 65/35 poly/cotton. Dyed-to-match drawstring. Reversible construction. Back pocket on both sides. 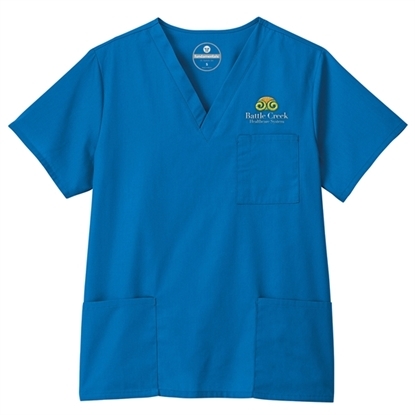 With a traditional full cut, our reversible scrub top keeps you professional-looking.4.2 oz, 65/35 poly/cotton. Reversible construction. Chest pocket on both sides. Set-in sleeves. 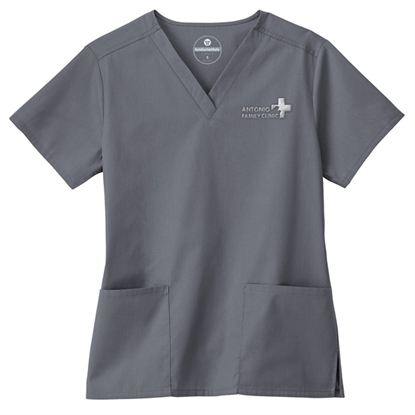 Add this Fundamentals ladies' two pocket V-neck top to your next promotion to appeal to new and potential clients in medical professions! Made of 65% polyester, 35% cotton material with soil release, it's offered in a wide variety of sizes to help outfit the entire team. The shirt features set-in sleeves, two patch pockets and side slits. It's a non-contrast shirt and has a 28" length. Add your company's name or logo before outfitting your crew in a uniform they're sure to love wearing! Make sure your team looks amazing with this Fundamentals unisex one pocket top! Made of 65% polyester, 35% cotton material with soil release, it's offered in a wide variety of sizes to help outfit the entire crew. The shirt features set-in sleeves and a chest pocket with a pen slit. It's a non-contrast shirt and has a 29" length. Add your company's name or logo before creating a look that everyone is sure to love wearing around the office or hospital! Outfit your team in this Fundamentals unisex three pocket top to make sure they have everything they need at hand! Made of 65% polyester, 35% cotton material with soil release, it's offered in a wide variety of sizes to help outfit the entire crew. The shirt features set-in sleeves and three pockets-two deep patch pockets and one chest pocket with a pen slit. It's a non-contrast shirt and has a 29" length. Add your company's name or logo before creating a look that everyone is sure to love wearing! Mypromotionalpens.com offers the largest and best priced selection in Promotional Medical Uniforms. We will price compete and we won't be under sold. Let our graphic designers make your personalized Medical Uniforms standout above the crowd at no charge. We won't stop until you are completely satisfied with your custom Medical Uniforms art proof.Use category search filters on your left to help narrow your search to find exactly what you are looking for.